Now as the whole book is not about cheese, I should give you a plot outline: Jane is the sensible, organised, responsible member of her friendship group. So of course she’s the one tasked with keeping her Bridezilla friend’s soon-to-be brother-in-law out of trouble in the run up to the wedding. Cameron has just been kicked out of the army (with the Canadian equivalent of a dishonourable discharge) after his attempt at turning his life around went awry. He’s got a list of things that he wants to do now he’s free of the military’s rules and he’s determined to tick them all off before his brother gets married. The last thing he needs is someone dogging his every move to keep him in line. Of course we all know what’s going to happen here – these two opposites are going to fall for each other and we’re going to learn that there’s a lot more to Cameron than his bad boy reputation. Hint: he definitely got a rough deal from the army. Jane needs some one to challenge her and get her out of her comfort zone and he needs someone to prove to him that he is more than other people think he is and that he can have the future that he wants to have. I would chalk this up as reasonably steamy – there’s quite a lot of bedroom action here, and it’s a little bit more… adventurous than some of the others I’ve read recently. 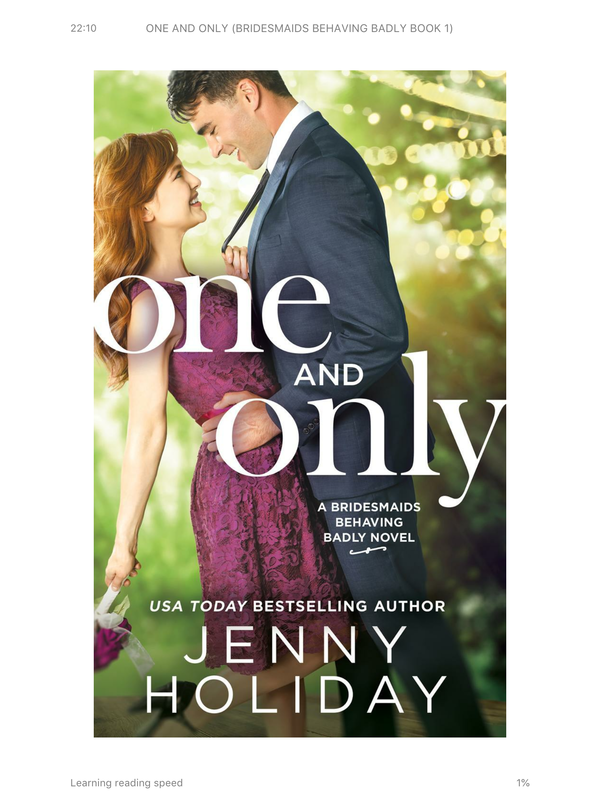 The other great thing about this book is Jane’s group of friends – they’re fun and supportive, even the Bridezilla (who is also a great comic turn). I also loved the setting – I can’t remember the last time (if ever) I read a contemporary romance set in Canada and this left me a) wanting more and b) wanting to visit Canada. It’s the first in the series and the sequel is out in June. I’m busy resisting the urge to go and buy more of Holiday’s back catalogue to read more of the grilled cheese scenes. You can get One and Only on Kindle and Kobo and Amazon also sell a paperback edition, although I’ve not worked out if it’s a UK edition or a US one which will affect whether you’ll be able to order it elsewhere. Summer is coming and with it I know a lot of you will be going to weddings, so get yourself in the mood with this!